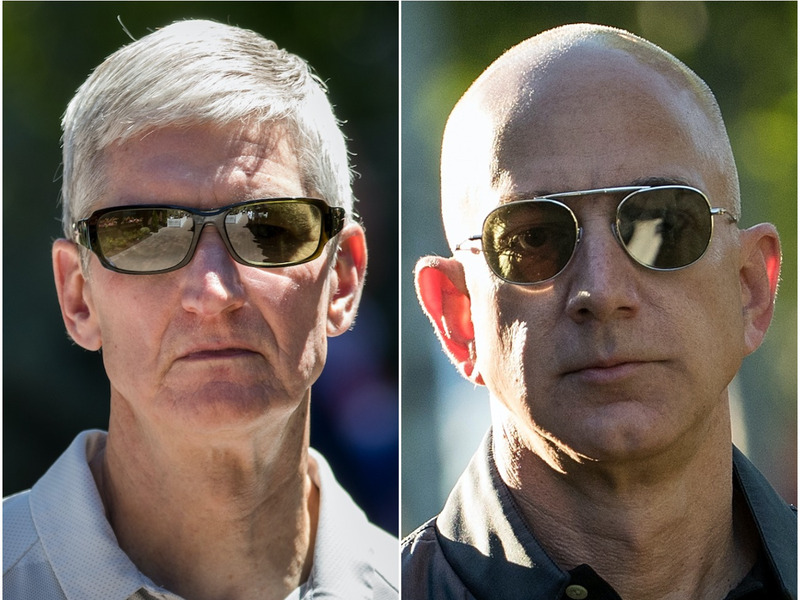 GettyApple CEO Tim Cook and Amazon CEO Jeff Bezos. Apple and Amazon have issued unusually robust on-the-record statements, refuting a Bloomberg report that Chinese spies planted microchips in hardware from supplier Super Micro. “We are deeply disappointed that in their dealings with us, Bloomberg’s reporters have not been open to the possibility that they or their sources might be wrong or misinformed,” Apple said, in part. “As we shared with Bloomberg BusinessWeek multiple times over the last couple months, this is untrue,” Amazon said, in part. Apple and Amazon have strongly rejected a Bloomberg report linking them to a giant Chinese plot to hack into the databases of US companies using tiny microchips. In unusually robust on the record statements, the two trillion dollar tech companies said they know nothing about Chinese spies planting rice grain-sized microchips in hardware that reached 30 major American companies. The full statement, which is available here, added that Apple always inspects its servers before they are put into production and if it found anything suspicious, it would have alerted the authorities. “We are deeply disappointed that in their dealings with us, Bloomberg’s reporters have not been open to the possibility that they or their sources might be wrong or misinformed,” Apple said. Bloomberg reported that Amazon performed a “network-wide audit” after the company found the malicious chips in Super Micro hardware in its Beijing data center. Amazon says this never occurred, as modified hardware or malicious chips were never found in its servers. Bloomberg also reported that the modified hardware was found in systems operated by Elemental Media, a company Amazon acquired in 2015, which the company also refutes. SuperMicro, the San Jose, Calif maker of the computer motherboards that the report says were compromised, told Bloomberg that it was not aware of any investigation. SuperMicro latter said it has “never found any malicious chips, nor been informed by any customer that such chips have been found… Supermicro has never been contacted by any government agencies either domestic or foreign regarding the alleged claims,” according to a tweet by Wall Street Journal reporter Robert McMillan. Bloomberg ran its original story with information from 17 unnamed intelligence and company sources.